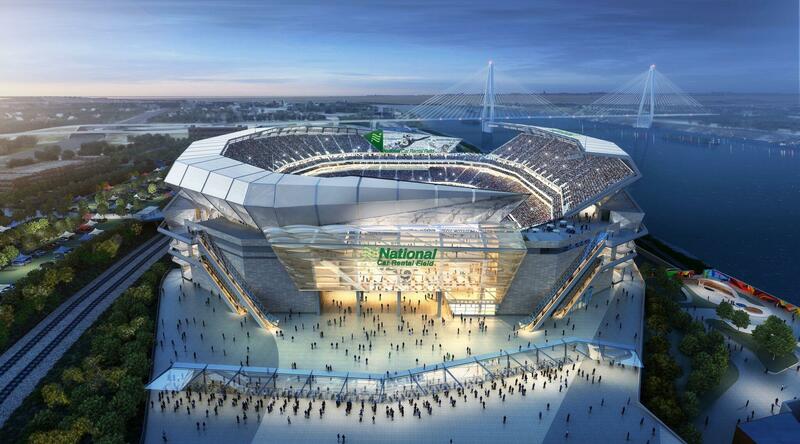 A rendering of the St. Louis riverfront stadium. 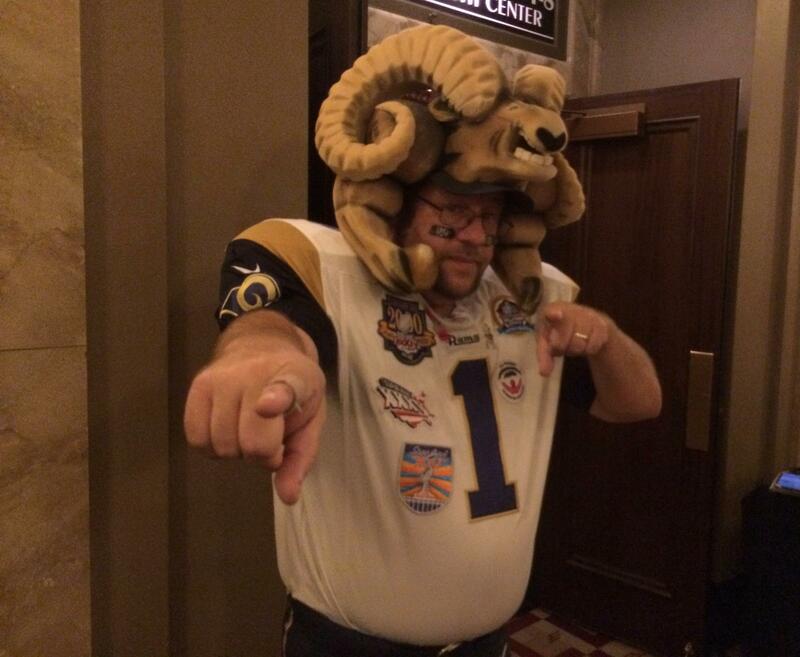 There are few fans in St. Louis quite like Ram Man. Ram Man — whose real name is Karl Sides — wears a hat molded in the shape of a snarling beast with spiraling horns. His jersey is adorned with patches celebrating the St. Louis Rams' achievements. And his unique admiration was worthy of the Pro Football Hall of Fame. But it will take more than extraordinary fan loyalty to keep an NFL team in St. Louis. 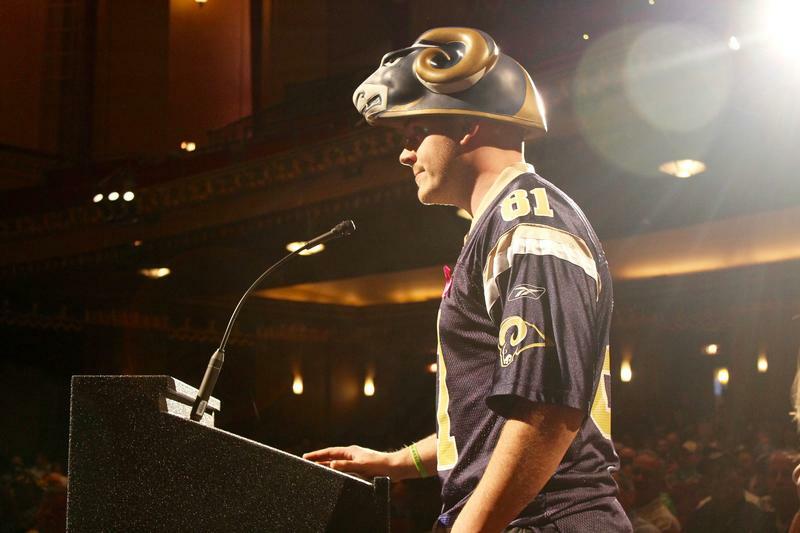 Karl Sides, also known as Ram Man, poses for a reporter a recent public meeting about the St. Louis Rams' future. After months of twists, turns, legal fights, legislative threats and, more recently, watchable football, the Rams' future in St. Louis could be hitting a critical juncture. Local and state politicians could make consequential decisions on funding a new stadium, while NFL owners may soon vote on whether the Rams, the San Diego Chargers or the Oakland Raiders will venture off to the Los Angeles area. Here's a look at what’s ahead — and what’s in the way — in this meandering stadium scramble. What happens in aldermanic chambers and within the minds of NFL owners over the next few weeks could prove crucial in determining pro football’s future in St. Louis. 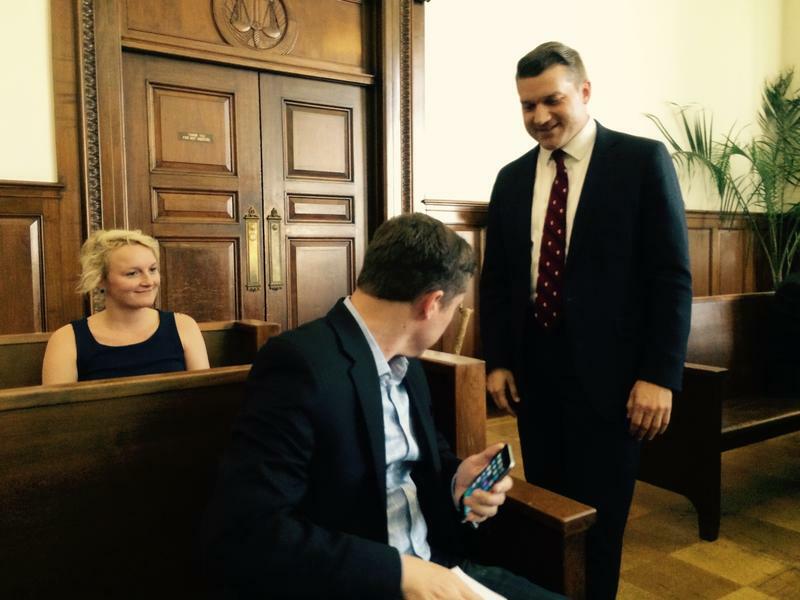 What does the Board of Aldermen have to do next? 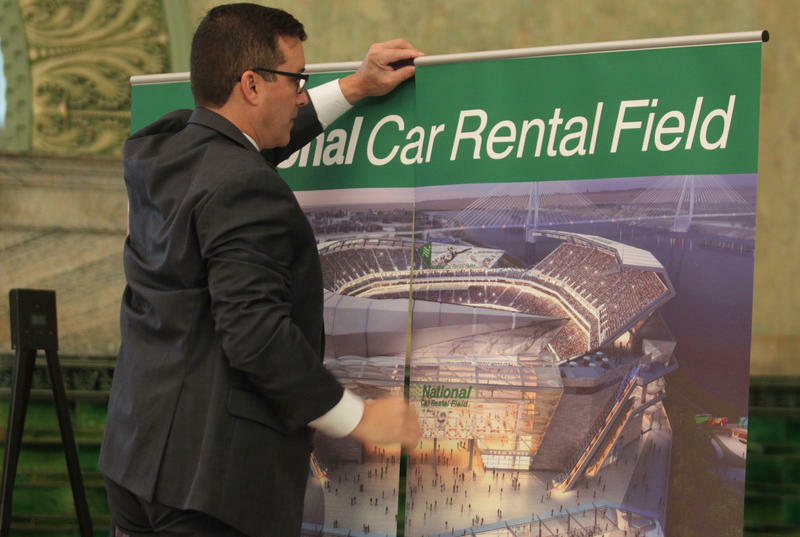 The stadium proposal is essentially a public-private partnership. About $610 million in non-public dollars would come from the owner of a NFL team, the NFL and personal seat licenses. The rest — roughly $390 million — would come from the state and the city of St. Louis. The St. Louis Board of Aldermen will soon consider a stadium financing package. Will the board pass the bill? While it’s always hard to predict the trajectory of legislation, there is probably a pathway to snag the 15 votes needed to pass the stadium bill. 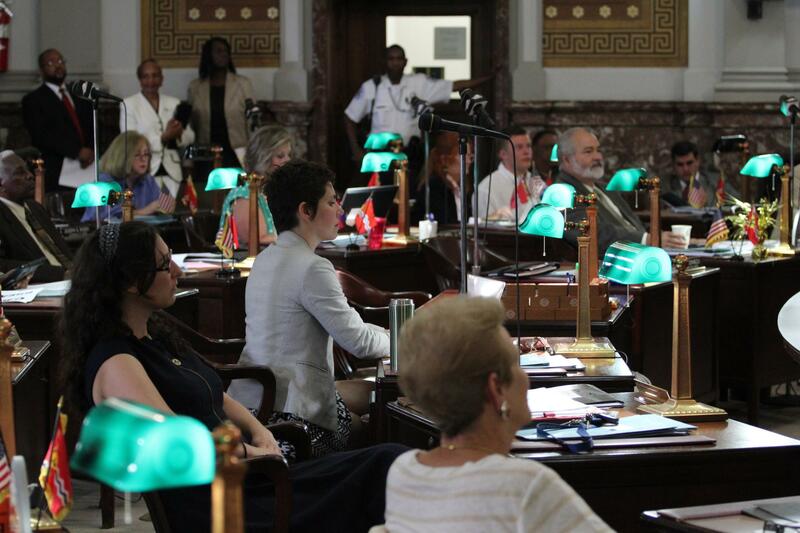 Most of the 29 votes in the board (the aldermen and the board president) are generally allied with St. Louis Mayor Francis Slay, who is a strong supporter of building the stadium. And it’s likely that organized labor groups will be pushing hard for a "yes" vote, which could sway some aldermen who are friendly with unions. 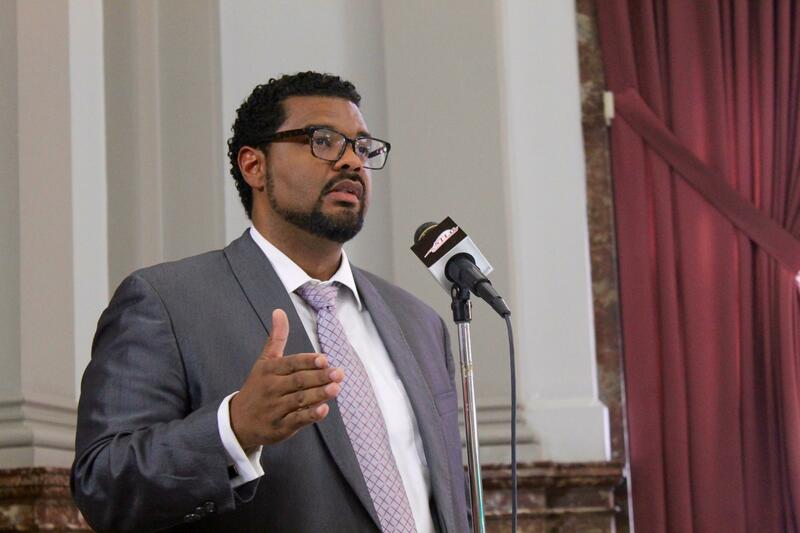 St. Louis Alderman Antonio French, D-21st Ward, is a member of the Ways and Means Committee. And he's one of a few aldermen on that committee who aren't exactly thrilled about the stadium proposal. But even the two sponsors of the bill, Aldermen Tammika Hubbard, D-5th Ward, and Jack Coatar, D-7th Ward, don’t expect their measure to get a rubber stamp — especially in the Ways and Means Committee. That committee has five members who will probably be very skeptical of stadium funding: Aldermen Antonio French, D-21st Ward; Chris Carter, D-27th Ward; Sam Moore, D-4th Ward; Terry Kennedy, D-18th Ward, and Scott Ogilvie, D-24th Ward. For the bill to pass out of committee, at least two or three of those five aforementioned aldermen will need to either vote for the legislation in committee — or not vote at all. And since Board of Aldermen President Lewis Reed can vote in any committee, he could hypothetically break a tie. Could stadium funding still be put up for a public vote? It’s possible, but definitely not a sure thing. First a little background: Earlier this year, a judge struck down an ordinance requiring a citywide vote to authorize any sort of aid to stadiums. 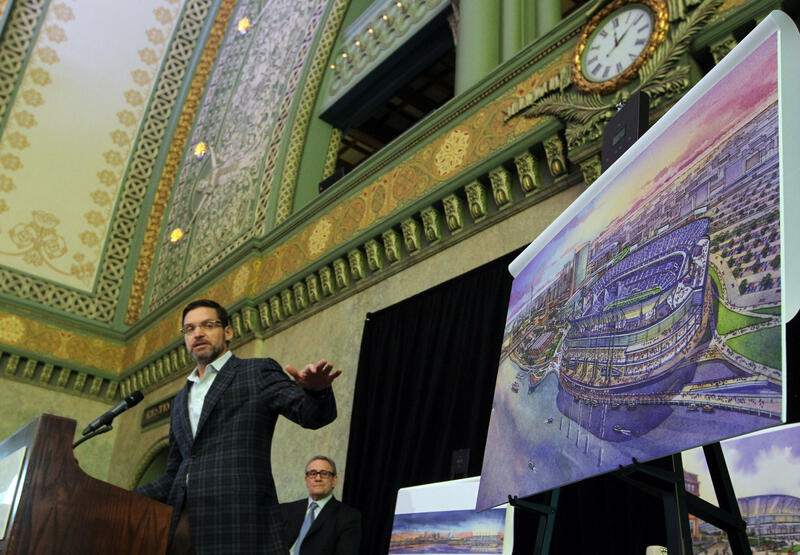 After that decision came down, Alderman Megan Green, D-15th Ward, put forward legislation to allow a citywide vote for the riverfront stadium project. It has five co-sponsors, including Alderman Christine Ingrassia. 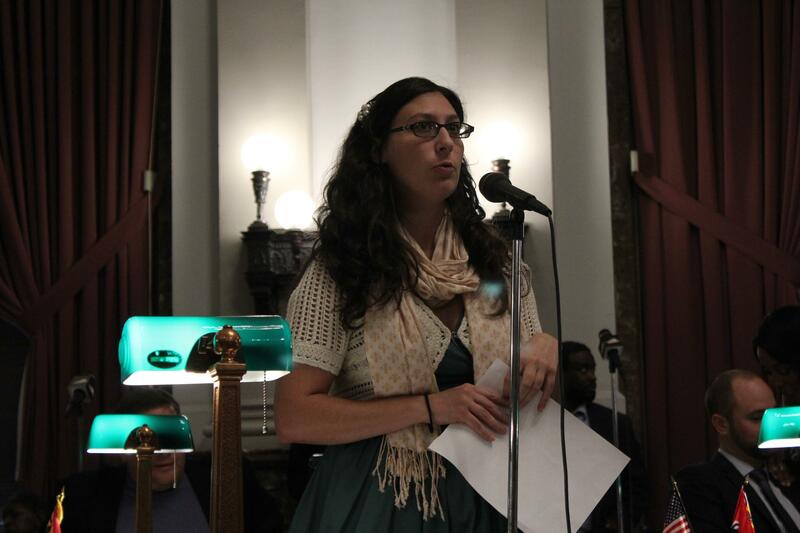 Alderman Megan Green, D-15th Ward, put forward a bill to have stadium funding predicated on a citywide vote. Green’s bill hasn’t received a hearing yet. And even if it got out of committee and passed the Board of Aldermen, Slay could veto the measure. But that doesn’t mean the legislation is meaningless. If Green’s bill makes it to the floor and receives more than 15 votes, it could showcase dissatisfaction within the board toward Hubbard and Coatar’s legislation. Is there any chance St. Louis County could contribute to the stadium? St. Louis County Executive Steve Stenger has said he's not opposed to the county contributing to the stadium — but emphasized that county residents need to approve any plan. What happened is not as cut-and-dried as saying the county "bowed out" of the funding equation: St. Louis County was initially set to contribute to stadium financing package when it was unveiled in January. 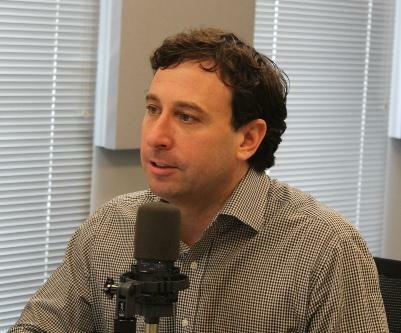 And while St. Louis County Executive Steve Stenger was not necessarily against St. Louis County contributing to the project, he was adamant that county residents vote on the matter — especially given a charter amendment. The only way the county could contribute would be for Nixon and the task force to reverse course and provide an opportunity for a countywide vote. That's not likely to happen now. So if the board passes its bill, does the stadium get built? No. And the reason is pretty simple: The stadium agreement is, among other things, contingent on a NFL team agreeing to a 30-year lease and for that team and the NFL to provide funding for the project. So in other words, if a team doesn’t agree to play in the proposed stadium, it doesn’t get built. 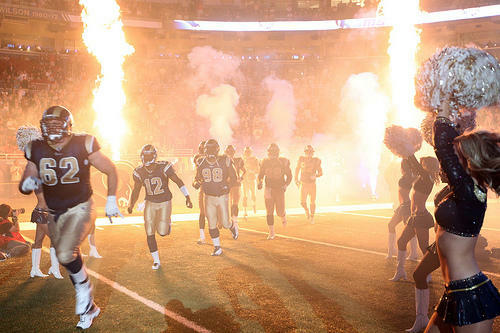 Do the St. Louis Rams even want to be here? The only person who knows for sure is Stan Kroenke, a billionaire businessman who took over controlling interest in the team about five years ago. He’s said pretty much nothing about his intentions to the media: When St. Louis Post-Dispatch reporter David Hunn tried to talk to him earlier this year, he “chuckled, but declined to comment." 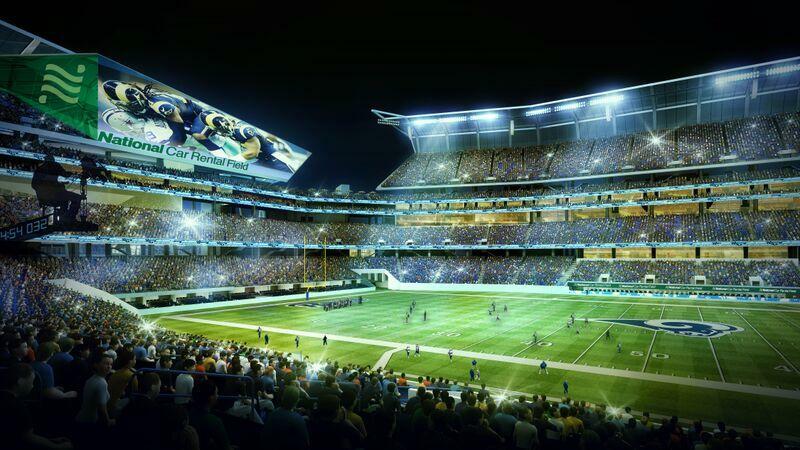 The St. Louis Rams could be headed back to the Los Angeles area if enough owners support their efforts. In any case, the fact that Kroenke unveiled a stadium plan in Inglewood, Calif., prompted many to assume that he’ll soon apply for relocation. The Oakland Raiders and the San Diego Chargers could also take similar steps soon. To actually move, a team would need the vote of three-fourths of the league’s owners — which is not exactly a sure thing. That vote is expected, as of now, to occur early next year, but none of the three teams has officially applied for relocation yet. 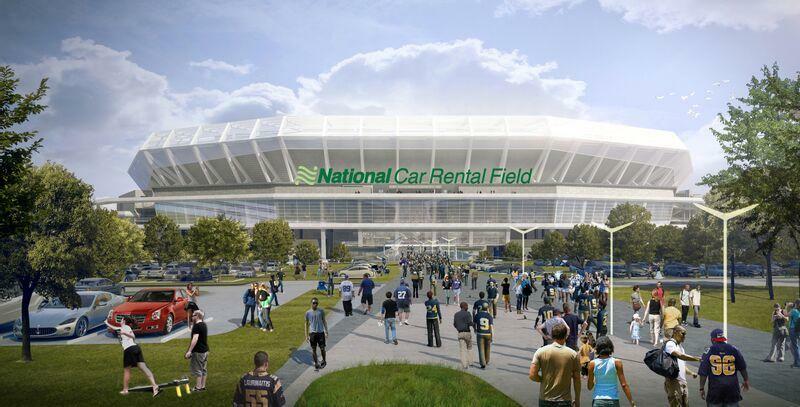 How will St. Louis’ stadium proposal affect the owners’ thinking? NFL executive Eric Grubman says owners are looking for three big things from cities hoping to keep a NFL team: First, there has to be an actual stadium plan — and an avenue to fund the facility. And it also has to be attractive to a team. Dave Peacock and Bob Blitz show off a drawing of a proposed stadium on St. Louis' riverfront earlier this year. Members of the two-person stadium task force — Dave Peacock and Bob Blitz — are set to present St. Louis' stadium plan to a select group of NFL owners next week in New York. The two men said in a statement that they were gratified by “the invitation and look forward to walking through our plan and answering any questions the league and its owners may have. If owners reject Kroenke’s bid to move, does that mean the new stadium gets built? The Edward Jones Dome, the place where the St. Louis Rams currently play. As first noted by St. Louis Magazine’s Ray Hartmann, Kroenke could simply have his team play in the Edward Jones Dome if his bid to move is voted down. After all, Kroenke may not want to invest a lot of his own money in a new stadium in a city that he wants to leave. Grubman hammered this point home during his recent appearance in St. Louis. What’s the status of the state’s funding for the stadium? Gov. 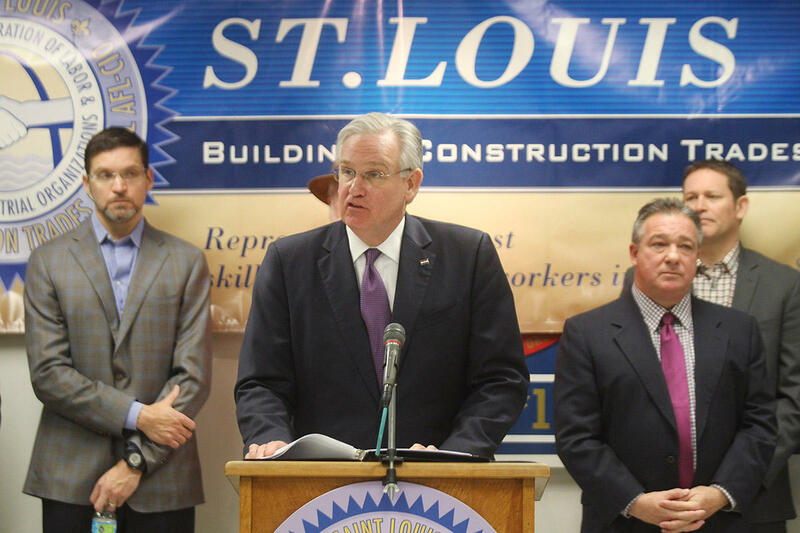 Jay Nixon has been a big supporter of the stadium project. But many of the people seeking to succeed him as governor are not supportive of issuing bonds for the project without a statewide or legislative vote. As noted in an earlier article, it's not out of the question the next governor may have to decide whether to issue state bonds for the project. And many of the GOP gubernatorial contenders are downright hostile to the idea of issuing bonds without a statewide or legislative vote. Will the legislature approve money to pay off the state bonds for the stadium? As of now, more than 20 senators and some key House leaders have said they will not appropriate state tax dollars to pay off bonds that aren’t first approved by a legislative or statewide vote. If those lawmakers stick to their guns, those appropriations will not make it through the budget process. That doesn’t necessarily mean that the stadium doesn’t get built. If investors still buy up the bonds despite the legislative threats of not paying them off, the cash will be there to build the stadium. But some political figures — such as Sen. Rob Schaaf, R-St. Joseph, and Lt. Gov. Peter Kinder — have openly questioned who would make such a purchase under those circumstances. Whether the legislature would withhold stadium payments for more than 30 years is a big, open question. But it’s almost certain that a refusal to appropriate would prompt a lot of complicated litigation. Would withholding payments on the bonds hurt the state’s credit rating? Neither Nixon’s Office of Administration nor the attorney general’s office provided St. Louis Public Radio with any definitive insight into what would happen to Missouri’s AAA bond rating if lawmakers refuse to appropriate money for the stadium bonds. That would be up to rating agencies, like Moody's or S&P. Sen. Rob Schaaf, R-St. Joseph, is one of numerous legislators who say they'll kill any appropriation to pay off stadium bonds issued without a statewide or legislative vote. Peacock told reporters last month that lawmakers may be hesitant to not appropriate bond payments because it could imperil the state’s credit rating. And Republicans like Kinder are reluctant to advocate for not paying off state debt, citing provisions in the Missouri Constitution. But others — like House Budget Committee vice chairman Scott Fitzpatrick and Schaaf — said the credit rating wouldn't necessarily affect their decision-making. In fact, Schaaf said: “If our state’s credit rating is damaged, then all that really means is that we won’t be able to go into debt — and if we can’t go into debt that means my children and grandchildren won’t have to bear more debt. What does stadium naming deal mean for St. Louisans' dreams of keeping Rams? Dave Peacock concedes that he undersold a bit to Enterprise Holdings when he talked with some of their top brass about sponsoring a roughly $1 billion stadium. On the eve of a public hearing about the St. Louis Rams’ future in the Gateway City, members of the Board of Aldermen are mulling over whether they’ll pick up part of the tab for the cost of a new stadium. The NFL is hosting a meeting Tuesday night at the Peabody Opera House for the public to sound off on the Rams’ potential relocation to the Los Angeles area. If the passion inside the Peabody Opera House could determine the future of the St. Louis Rams, then the team would probably stay in the Gateway City for eternity. After weeks of anticipation, members of the Board of Aldermen finally have legislation spelling out how the city will pay for a proposed riverfront stadium. 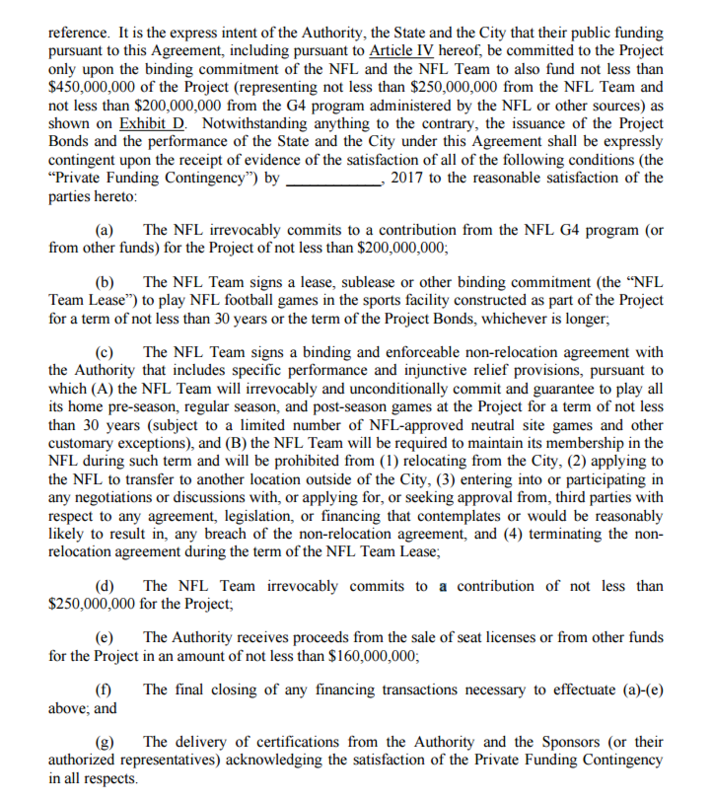 Aldermen Tammika Hubbard and Jack Coatar’s legislation is a critical portion of a multi-part financing plan for a stadium aimed at keeping the NFL in St. Louis. St. Louis Rams owner Stan Kroenke is planning to build a new stadium in Inglewood, Calif., which has prompted rampant speculation that the team’s days in St. Louis are numbered. 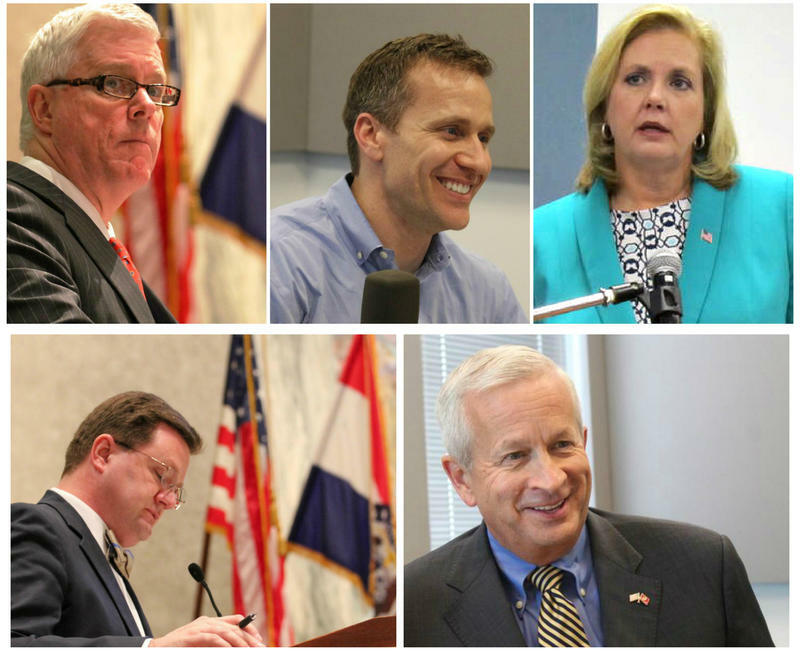 On the Trail: What do gubernatorial contenders think about Nixon's stadium push? It’s fair to say that Missouri state Sen. Rob Schaaf has been a thorn in Gov. Jay Nixon’s side over the proposed riverfront stadium in St. Louis. The St. Joseph Republican was one of the first members of the legislature to raise serious alarm about Nixon issuing state bonds for the $1 billion project without a legislative or statewide vote. More than 20 senators and some key House leaders have threatened to kill any state appropriation to pay off the stadium bonds if Nixon follows through. On the Trail: What happens if St. Louis' minimum wage law survives? When attorneys resume a legal fight this week over St. Louis’ minimum wage law, the atmosphere will be very different from when they first clashed in the courtroom. St. Louis City Counselor Winston Calvert and omnipresent litigator Jane Dueker are set to resume a high-stakes legal battle on Tuesday morning. Dueker is representing businesses and business groups seeking to dismantle St. Louis’ law raising the minimum wage to $11 an hour by 2018. Calvert (along with private attorneys from Dowd Bennett) is defending the statute.